I’VE been looking back through our photos of Santi this week as I desperately want to get going on a photo album before I go back to work, and even more importantly before he turns one. I tend to snap away on my phone, and have exceeded the memory more than once as I get a bit carried away, but in looking through the 2,000 photos from the last 10-and-a-half months I’ve come across a fair few lovely photos taken on our big camera that I’d forgotten about. This was taken when we were in Bluestone on the only dry day we had, and the light was lovely with the sun shining through the window. Santi is a 100mph baby, so in most of my photos a part of him is blurred. But here, little specks of dust in the air had caught his attention and he had a rare quiet moment just watching them float past. 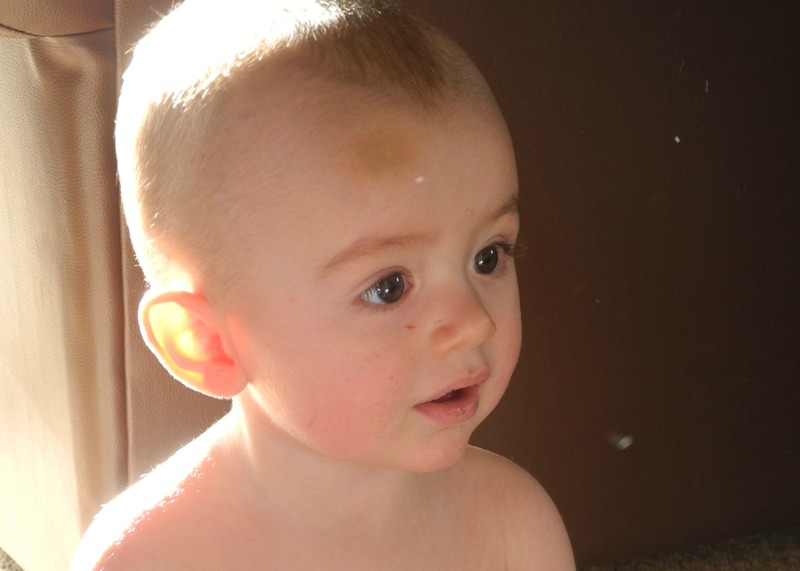 He’s got a bruise on his head because in his boisterous way he fell off the bed, and he’s almost naked as he refused to get dressed, but for a few minutes he was calm and had such a sweet expression that I had to capture it. Those rare moments of calm are truly to be treasured!! Being a mummy of a boy, I know how valuable that is! Lovely photo! I’m the same, constantly using up all my phone memory with all the photos! Someone should tell you if you’re having a baby get the biggest phone memory you can! Definitely … There was no warning that I’d have to delete all my apps to free up space! Good luck with Theo – naps are like gold dust!